My name is Kenny and I am 19 years old. 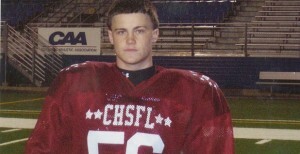 I have been playing football since I was 8 and always dreamed of playing college football. During my senior year in high school, I hurt my shoulder during a football game. I saw a doctor after the game who said it was a bad strain / pulled muscle. During my freshman year of college football the pain in my shoulder became unbearable. My mother recommended Dr. Christopher Ahmad because she worked at Columbia and said they had a great reputation for Sports Medicine. When I saw Dr. Ahmad, he told me I had a tear in shoulder and needed surgery to repair it. Needless to say, I was very upset. I thought my football career was over, but he reassured me that I would be able to play again as long as I followed his instructions after surgery and did all of the rehab. Dr. Ahmad even worked to arrange the surgery so that I would not miss too much school. He and his team were great, always available to answer questions for me and the rehab team at my school. It has been more than a year since the surgery and my arm feels great and I am playing football again. I would recommend Dr. Ahmad and his team to any of my friends if they were injured!